VANCOUVER, BC and NEW YORK, NY--(Marketwire - May 1, 2008) - NewspaperDirect Inc. and Nielsen Business Media today announced the launch of Back Stage Digital Edition -- the online electronic replica of the weekly publication which, for the past 47 years, has been the most trusted resource for actors looking to find performing arts and casting information. Back Stage Digital Edition is powered by NewspaperDirect's SmartEdition e-magazine technology. The new digital edition requires no installation and gives subscribers instant access to a digital facsimile of the full printed edition of the publication -- on PCs, Macs, Blackberry devices, smart phones, iPhones, and iPod Touch devices -- before it hits the newsstands in the New York tri-state area, Los Angeles, and other regional acting hotspots. "Back Stage has always been a leading resource for actors, in print and on the Web," said Neil Eisenberg, audience marketing director at Nielsen Business Media. "In working with NewspaperDirect on Back Stage Digital Edition, we have taken the publication and our readers' experience to a whole new level, offering subscribers advanced digital features that enhance their reading pleasure and enable them to interact with industry-specific service providers like never before. "Distributing Back Stage Digital Edition through NewspaperDirect couldn't be easier. We send the PDFs of our East and West Coast editions to them when we send the paper to print, and they take care of everything else." Advanced digital features that NewspaperDirect enables include easy-to-use navigation tools, powerful keyword searching, keyword monitoring with email notification, article sharing, a one-click 'add to my blog' feature, instant translation in up to 12 languages, integrated audio, back-issue access, photo galleries, and social media integration with Facebook, Digg and Del.icio.us. Back Stage Digital Edition also incorporates NewspaperDirect's Adget technology, which enables new forms of interactivity between readers, directors, advertisers and other industry-specific service providers. With Back Stage Digital Edition, readers will be able to book a casting call and interact with casting directors, submit resumes and portfolios, book appointments with photographers, and connect with other advertisers without ever leaving the publication. "We are very pleased to have such a distinguished publisher as Nielsen Business Media choose NewspaperDirect as its digital publishing partner," said Alexander Kroogman, CEO of NewspaperDirect. "SmartEdition technology not only enables Nielsen and Back Stage to publish electronic editions that will delight readers with a wealth of new digital features, it positions them to take advantage of emerging business opportunities that better monetize their new digital editions." NewspaperDirect's powerful Adget advertising platform, reputation for operational excellence, and its risk-free business model that requires zero investment and zero operational cost on the part of publishers, makes the company an ideal partner for publishers. Nielsen Business Media worked with NewspaperDirect last year to launch The Hollywood Reporter Digital Edition and will launch a number of other digital editions in upcoming months. 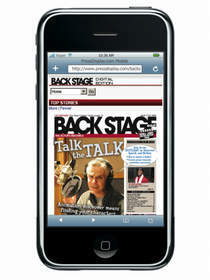 A free trial subscription to Back Stage's digital edition is available at http://www.backstage.com/digital. For 47 years, Back Stage has been the most trusted resource for actors to find performing arts and casting information. Back Stage East, Back Stage West and Backstage.com serve the performer in the theater, film and TV industries, providing the most up-to-date news, reviews and casting information. Back Stage delivers all the tools an actor needs to succeed and to maintain career momentum in this competitive marketplace. Back Stage is published by Nielsen Business Media, a part of The Nielsen Company, a global information and media company. Founded in 1999 and based in Vancouver, Canada, NewspaperDirect Inc. (www.newspaperdirect.com) is the world leader in multi-channel newspaper and magazine content distribution and monetization. PressDisplay.com from NewspaperDirect is the world's largest online newspaper kiosk, providing instant access to hundreds of newspapers and magazines from around the world. Users can read full-content publications online, download titles for offline viewing, instantly translate articles into 12 different languages, listen to publications on their computers or mobile phones, and enjoy reading hundreds of publications that have been optimized for smart mobile phones, BlackBerry devices, iPhone, and iPod Touch. NewspaperDirect has also adapted PressDisplay.com for the library, corporate, airline, hotel and OEM markets. NewspaperDirect's SmartEdition e-paper solution, powered by PressDisplay technology, fits every publisher's needs with zero investment and zero operational cost. With SmartEdition, a publisher's subscribers benefit from anywhere/anytime access to current and back issues of their publications, while enjoying premium digital features such as voice, translation, article sharing through email or their blogs, social network integration, picture galleries, advanced search and media monitoring. NewspaperDirect provides full hosting, payment acceptance, customer service management and full technical support. NewspaperDirect operates premium sites for local, national and international newspapers and magazines around the world, including: The Washington Post, New York Post, Boston Herald, The Jerusalem Post, Bangkok Post, The Australian, The Daily Telegraph, The Times, Daily Mail, Le Figaro, The Hollywood Reporter, Newspapers & Technology, and all 11 CanWest publications, including National Post. NewspaperDirect also offers hundreds of newspaper and magazine titles through a global network of more than 1,200 print locations in 105 countries, delivering them to hotels, libraries, cruise ships, yachts, corporate and government offices, retail outlets and home subscribers. PressDisplay.com and SmartEdition are trademarks or registered trademarks of NewspaperDirect Inc. All other trademarks and registered trademarks belong to their respective owners. About this company NewspaperDirect Inc.